The DRM Chair has structural joints made of a meltable plastic material. A pressure sensitive counter in the chair detects when it is sat on. The designers could set the self destruction counter to anything but they chose eight simply so everyone in the design group could have one sit. An Arduino computer triggered the chair’s joints to all be melted following the eighth person’s sitting session. 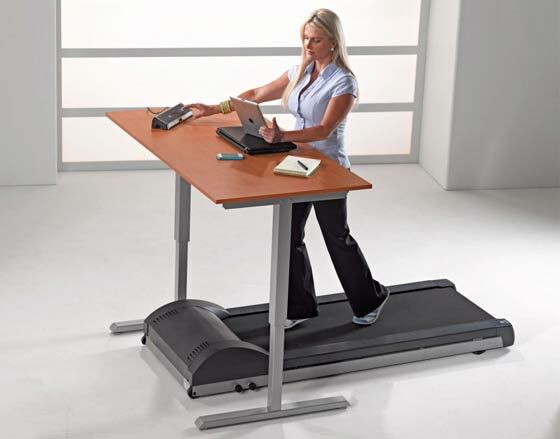 At the weekend TechCrunch published an interesting article singing the praises of “walking desks”. I’ve spent time on a regular treadmill and found the experience extremely boring so I’m sure a computer workstation at the end of it would make time upon the treadmill much more engaging. The TechCrunch writer Gregory Feinstein said of his experience, using a walking desk for a month, that there were very few drawbacks and a lot of positive aspects to the experience. The best things about the walking desk, according to Feinstein, were calorie burn and fitness improvements. He doesn’t really mention his work performance, though I have previously read some philosopher praise the value of “walking thoughts”. Perhaps Marissa Mayer could have equipped Yahoo homeworkers with treadmills sensing their presence at the computer, rather than simply banning teleworking? Please someone, send TechCrunch a link to that episode of World's Craziest Fools that dealt with treadmills. Looking at that picture conjures up an image of class action suits being bought in the States by folks who have destroyed their dental work while slipping on the treadmill. Plus, that'll cost money to run - far better to make the poor human-hamster power their PC by treadmill generator and fire them if they can't get their work done. As you say - “perhaps”. But then again, it might have been more productive (and easier) to hold the teleworker's managers responsible for ensuring their staff are actually getting the work done. You know … that thing called “people management”. If my boss wants to check on me all he has to do is phone/IM me - if I answer then I'm working, otherwise not. Simple! With a double check of “giving me stuff to do” and if I do it then I'm definitely working. May sum up why using a treadmill is a bad idea at work! “Presumably - like other DRM schemes - some nasty ”pirate“ promptly ‘hacked’ the chair by removing the power from the Arduino”: Brilliant!!! I think the fact that someone even thought to do something like this is what makes us amazing as a species. Our inquisitive nature, our creativity, our willingness to try new things just for the hell of it. Those are the qualities that, ultimately, will save us from extinction. Polar bear on treadmill is much funnier - and yes sometimes I also despair of the world till I see some of the yummy mummies on the school run!